I don’t know why but when I was younger I was not a fan of carrot cake. Now it is one of my very favorites! After some experimenting I found the perfect combination and I’m sharing my Gluten-Free Carrot Cake recipe with you. My oldest son and husband absolutely love carrot cake and my husband said this was one of the best he had ever tasted. My boys are brutality honest so when they tell me it is really good I know it is true. In this recipe I substituted butter or oil with applesauce and it turned out great and is better for you! This recipe used Gluten-Free all purpose flour but it will work with regular flour too. Also, I made mine into cupcakes but this recipe will work for a cake too. Mix all dry ingredients. GF Flour, baking soda, baking powder, spices, and sugars. Finely Chop 1 cup of pecans. Pour batter in cupcake cups until cup is 3/4 full. Bake for 18-20 minutes or until toothpick comes out clean. Let cool completely then frost. Crush 1/2 cup of pecans. 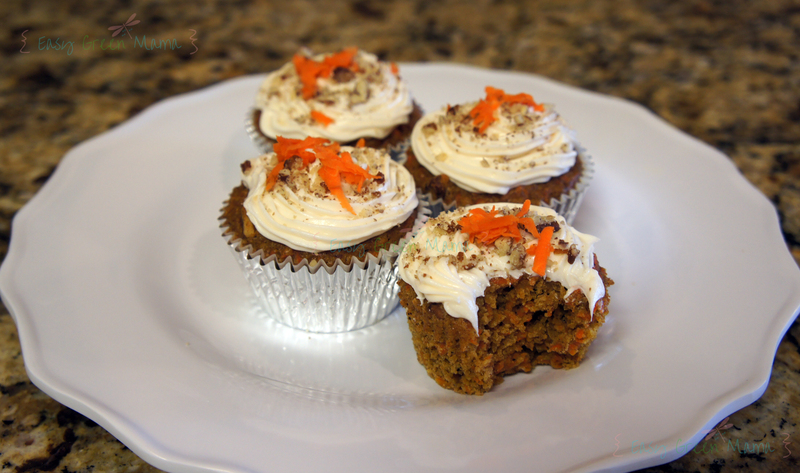 Sprinkle grated carrots and crushed pecans on top of each cupcake. Hope you enjoy this recipe! Check out my other gluten-free recipes HERE. These look spectacular! Funny, when I was younger I couldn’t stand carrot cake either. Now it is my favorite! I am so surprised that you like Bob’s Red Mill GF flour. I think the flavor is über icky. Grainy. Sweet. Blech. I’m generally a Bob’s fan, just not any of the GF products. KL, we have been using Bob’s flour for years now. My family likes it and I like that I can buy it in bulk on Amazon! What flour do you use? I concur! We have to also watch out for a son’s MSPI (Milk/Soy Protein Intolerance) as well and we find Better Batter GF Flour to be the BEST all around and cup-for-cup GF flour! I haven’t tried Better Batter yet. I will have to give it a try. I posted this on Facebook and am getting comments that it is not gluten free. You might want to add “gluten-free” in front of “All Purpose Flour,” even though you say in your post that you used gf flour. Thanks for the suggestion. I will edit this so it’s more clear. These look good, I will definitely try them. Just starting out with GF, very discouraged with baking. I used King Arthur AND Bob’s blends and both left a weird grainy texture for me in things so far. I have a question – we only have mini carrots and I want to make this delish looking dessert NOW! about how many cup(s) of carrots total are needed? It made almost 3 cups of grated carrots. Enjoy! Hi.. I just have a question about the recipe… 1/2 cloves of what? I´m really sorry, but i´m brazilian and I don´t know very well the gastronomy vocabulary. Thank´s! it’s 1/2 teaspoon of ground clove. You will find it with spices at the store. Is this for regular size cupcakes or mini cupcakes? These are regular size cupcakes. The applesauce substitutes the butter or oil. Every time I make it comes out very moist as cupcakes or cakes. What type of applesauce did you use? I love using applesauce in place of oil…lower fat, and it adds a slightly fruity taste! I’d rather have cupcakes since they’re easier to serve and eat. Mmmmm!!! I just found what Im bringing for Easter!! These sound amazing!! Carrot cakes are one of my favorite. I am gonna have to try these. Yummy. We don t have apple sauce in Egypt. Can you explain how it looks like. We can prepare it like apple juice or apple puree? Hello Rasha, apple puree is very similar to apple sauce and it can be used interchangeably. So you dont need to add xanixgum? Lisa, I never use xanthan gum for this recipe and it turns great every time. The ingredients in this recipe stick and bind together fine without the use of xanthun gum. Carrot cake is my favorite! This is JUST what we’re making for Easter weekend. Thanks for sharing. love to try these … never used gluten-free flour before! Thanks for the idea! These look so delicious–I want to try them right now! These look so good I love carrot cake so these will be great to make! I love carrot cake but have never had it in cupcake form before! These look great. I love carrot cake. I like that they are GF. If I wanted to make it into a cake instead of cupcakes….Do I change the baking time? Also, If I don’t have applesauce available, how much oil would I use in place of the applesauce? This recipe works as a cake too. Cooking time is 20-24 minutes for cakes. If you do not have applesause use 1 cup of softened butter or oil. This sounds amazing, thank you for sharing with us. I think these are nice for fall. These look so delicious! Thanks for sharing the recipe!